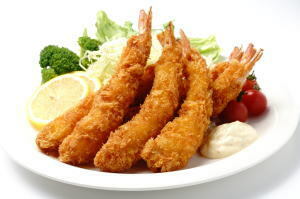 Ebi Furai ('海老フライ', is classified into deep-fried dish), is known as Fried Prawn in English, and 日式炸虾 (Rì shì zhà xiā) in Chinese. Shrimp, Egg, Wheat Flour, Oil, Breadcrumbs, Salt. Copyright©2015-2019 Oksfood all rights reserved.